Anika and Theo are two very happy babies. 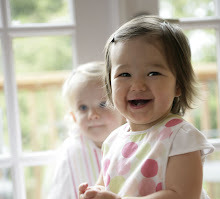 When Scott and Dina learned they were having boy/girl twins, they were immediately drawn to Babylicious. And, they asked Babylicious (we don't normally provide personalized decorating services) to dress their nursery! Decorating their nursery was fun and easy. We thought we'd share what we did, step by step, so you can make your baby's room Babylicious with minimal effort (and save your energy for more important stuff like pampering yourself before baby comes!). Scott and Dina's love for everything modern was evident throughout their century-old home. So it made sense to decorate the nursery, which is a part of their home, with modern and traditional elements. They wanted the babies' room to look like it flowed with the rest of the house and was in keeping with their aesthetic sensibilities. The first thing we did was choose the right bedding for their two cribs. The crib is a nursery's focal point, and choosing a pattern that you love for this main piece of furniture is key. Decorating is easy when everything else that you use to decorate the room with, flows from the bedding. Scott and Dina already had cribs with traditional lines (in keeping with their older home), and wanted to go modern in dressing them, so they chose the Babylicious Happy Collection. It was the right pick for the bright and cheerful nursery: it is simple, uncluttered but still sweet. 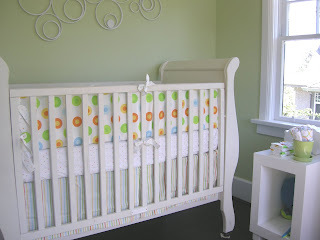 We kept the nursery walls a pretty neutral colour so that the decorative elements around the room would really pop. It was easy to find accessories that match the Babylicious Happy Collection. 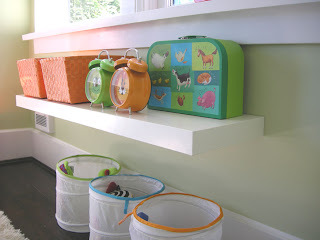 We found zesty orange baskets from the Land of Nod to match, cute-as-can-be lime-green and orange alarm clocks and a fabulously coordinating lunchbox and perched them on top of a simple white IKEA (from the LACK collection) floating shelf -- a great, unassuming backdrop to your favourite kid-friendly chachkas.